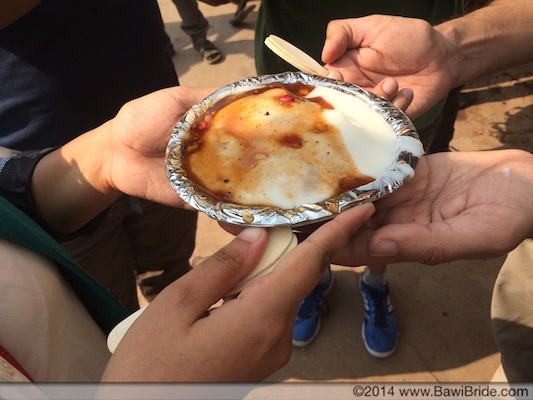 I recently stopped over in Delhi for a day enroute to Jim Corbett National Park. Having lived in India for over 3 years now I’ve accepted that one can’t do or see as many places in a day as you could overseas. However, having heard so much about the culinary extravaganza that is Purani Dilli I was determined to make the most of my day. In preparation for the big day, I’d done several hours of research of where to stop and what to eat. I even printed out a hand-drawn map of Purani Dilli’s bylanes to guide me. In hindsight though all that was a bit pointless as Purani Dilli is a sensory overload and there are interesting things to eat everywhere your eyes rest. Come hungry and wear comfortable shoes is what I’d advise everyone! Over the course of our Sunday in Purani Dilli we walked eight kms and tried nine different places spread across Jama Masjid, Chawri Bazaar, Chandni Chowk and Darya Gunj. It was the best one-day stopover I’ve ever had in a city till date. 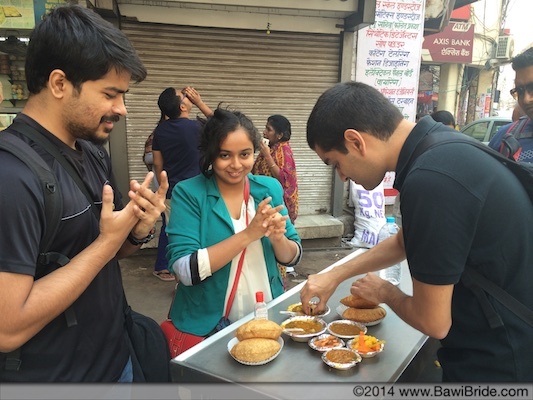 We started the day in Chawri Bazaar by trying the Bedum Puri at Shyam Sweets. Hot crispy puris accompanied by a sour and spicy potato subzi this was the perfect start to our day – especially since I hadn’t eaten any breakfast. 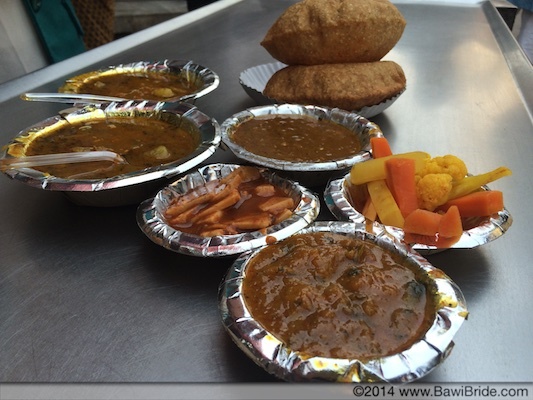 The Bedum Puri comes with a potato pickle called ‘Kachauli Chat’ which is a must try. 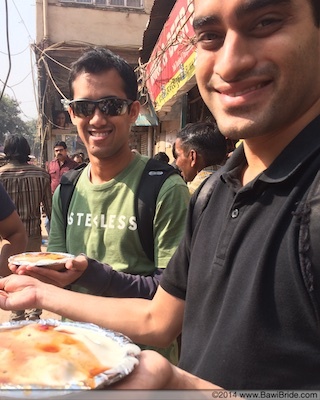 Passing through a lane known for selling second and third hand books, we arrived at the renowned Natraj for Dahi Bhalla. For those not familiar with this dish, the bhalla is a bigger and sweeter version of the dahi vada of Mumbai. The bhalla is served with yogurt and a tamarind chutney. Overall, it was a bit too sweet for my palate. The next stop was the famous Paranthewali Gali – a lane where coincidentally every store seems to have been around for ‘six genration’. 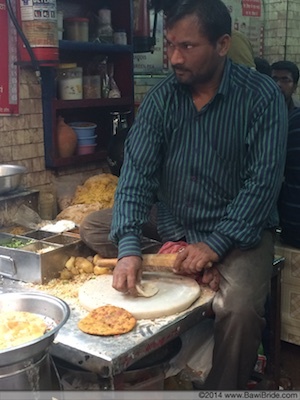 Each of the stores have about 20 different kinds of parathas and they all come deep fried in ghee with a potato subzi on the side. 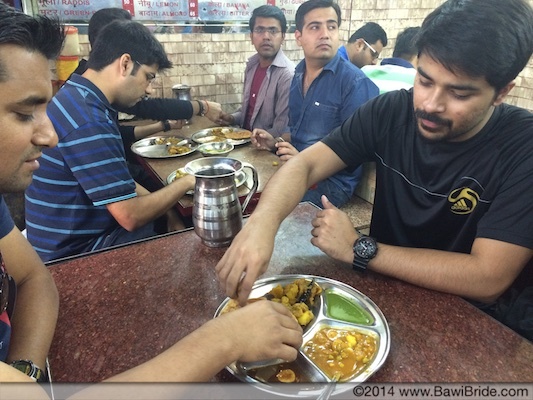 We ate ours at the ‘Parawthewala’ whose store has been apparently visited by both Ranbir Kapoor and Imtiaz Ali. We gave the stock options of Aloo, Gobi and Matar a skip and instead tried the Nimbu (Lemon), Dal (Lentil), Gajar (carrot), Paneer and Mirchi (Chilli) parathas. My favourite was the Nimbu one which is deliciously tart and chatpata. The Mirchi that comes absolutely stuffed with green chilli slivers came a close second. 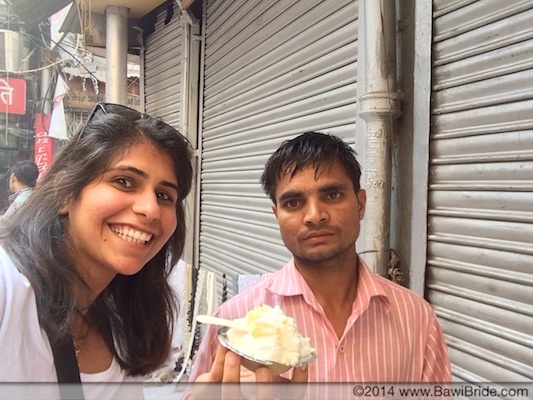 After all this savoury food, it was time for something sweet and I stopped at the side for some Daulat Ki Chaat. 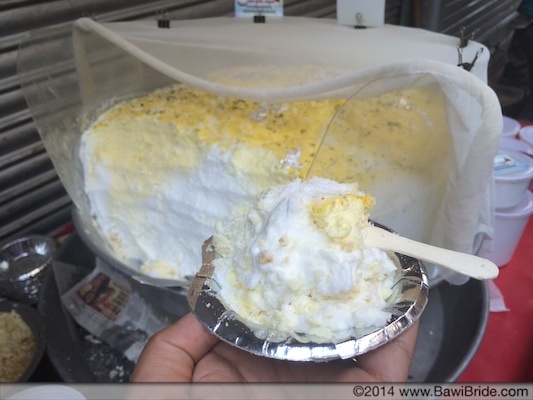 Light and airy, Daulat Ki Chaat is a dessert made with whipped milk, cream and khoya, which is then topped with chopped pistachios. It’s only available in the winters and I really enjoyed this one as it closely resembles the Parsi Dudh na Puff that are available in Mumbai and Udvada. The only difference is that the puff is made with only whipped milk and comes topped with cardamom. We didn’t stop there and also tried some butter biscuits from the biscuit thela’s dotting the lanes. At only Rs 30/- for 100gms, they were an absolute steal and tasted very much like the Parsi Nankhatai. 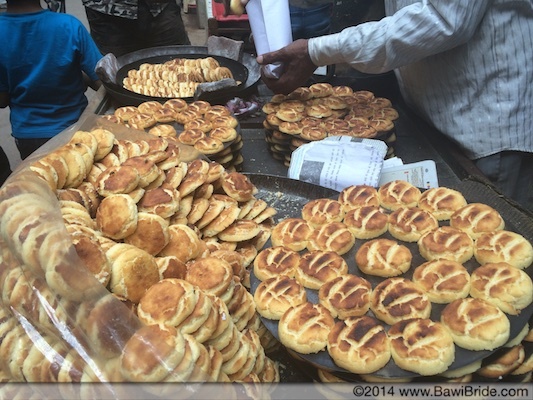 The vendors keep these cookies warm by placing them under a charcoal tava and they have enough butter to simply melt on your tongue! After all this eating it was time for some walking (to the next food stop ofcourse). 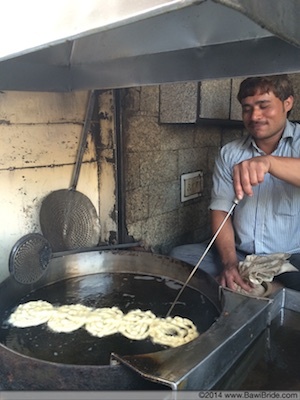 We passed the Gurudwara and stopped at the Mushhoor (famous) Jalebiwala for some hot jalebis. The dough of these jalebis is not as sweet or thin as its Mumbai counterpart and while they were nice they personally didn’t live up to its hype for me. It didn’t stop me from scoffing down a couple of pieces but I’d rather have the ones available at the thela outside Dadar Parsi Colony who has been selling jalebis for over 80 years. Having finished the vegetarian part of our food trail we now headed towards Lal Quila (Red Fort) on foot and kept walking to loop back towards Jama Masjid. On the agenda here was Al Jawahar and Karim’s. I found Al Jawahar’s very disappointing but it could be that the Chicken Seekh was the wrong thing to order here. In contrast, Karim’s – about 40 steps away from Al Jawahar – was my favourite stop of the day and totally lives up to all the hype. 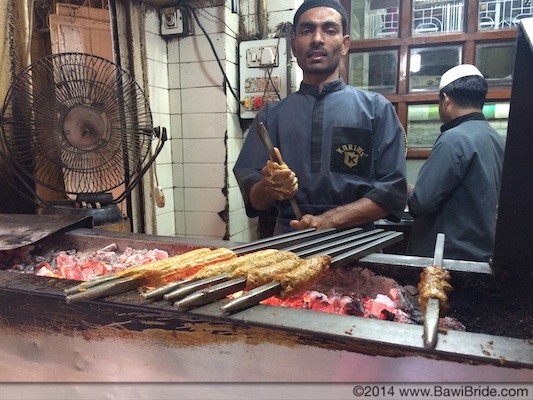 We had the Chicken Burra and Mutton Korma here along with the Tandoori Roti and my tastebuds came alive. 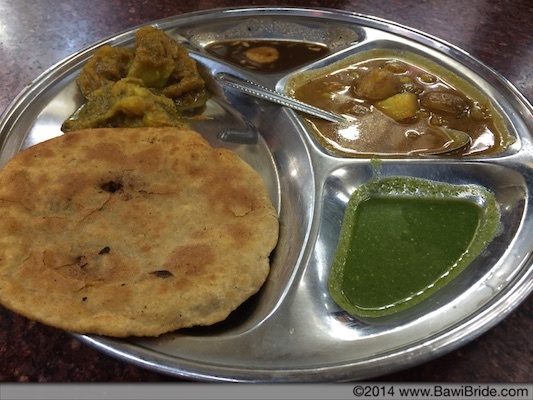 The roti was soft, the chicken lightly spiced and moist and the Korma both tangy and spicy. 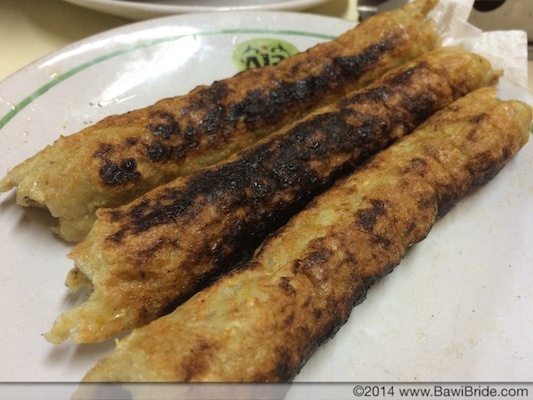 I have just two words for you – must try! At this point we had walked almost 6km and were dead on our feet. 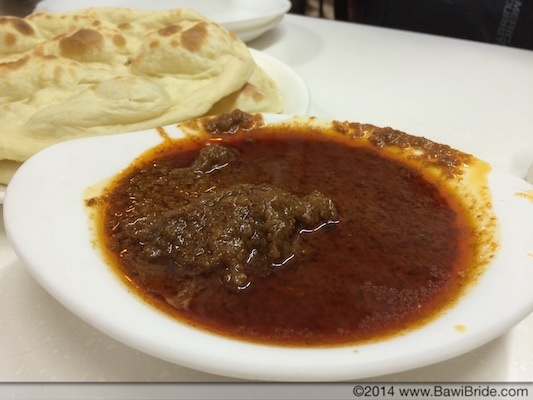 The only thing keeping us going was the thought of trying butter chicken at Moti Mahal in Darya Gunj. While you could probably find any number of ‘Moti Mahal’s’ spread across India this restaurant is where butter chicken was invented hundred years ago in 1914. I’ll be honest and say that the covered hall of the restaurant looked quite run down but I was tempted to overlook the fading pink walls when I read that the restaurant’s Mughlai food was praised by the likes of Gordon Ramsay and Heston Blumenthal. We weren’t disappointed. The boneless Butter Chicken we ordered was creamy and sweet and came with generous helpings of chicken cooked in the tandoor. Despite protesting that we wouldn’t be able to put anything further in our mouths, the five of us polished this off in about 5 minutes amidst various appreciative mumblings ranging from ‘Oh My God’ to ‘Hmmmmm’ to ‘Yummm’. While we didn’t get to the Sohan Papdi at Ghantewala Sweets, the Kachori’s in Paranthewali Gali and the Shahi Tukda, this was one culinary adventure that I will be talking about for years to come. A special thank you to my friend Vipul Yadav fondly known as Sporty Baba and to Yummraj for all their foodie advice! 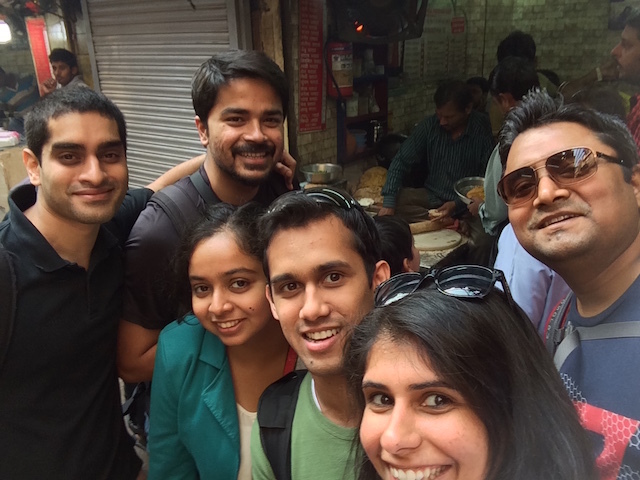 Thank you also to Ennovent team member, Vineet Kumar for taking us through the journey and for watching me scoff my face for over 5 hours – we couldn’t have navigated the streets of Purani Dilli without you! There were so many places we missed out but one would need superhuman tummy strength to have all that food in one day! I’ll definitely go once again in the evening as hardly any kebab places were open when we went and I’m told they are the ‘shaan’ of Purani Dilli. I read in your Purani Dilli Blog that Butter Chicken was developed at Moti Mahal in 1914. 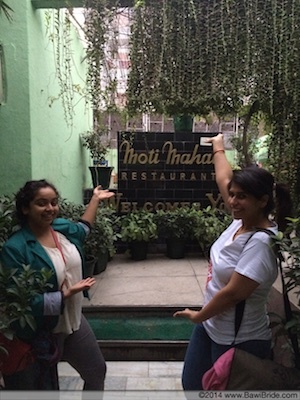 This restaurant Moti Mahal was founded by Mr. Kundan Lal Gujral, when he came to Delhi after partition. So this restaurant has opened only post 1947 and not 33 odd years earlier (around 1914). Mr. Gujral introduced Tandoori Chicken (for the first time in India) at this restaurant, located first at Chandani Chowk and moving here at Darya Gunj, a little later. I have read that Mr. Gujral used to work at Moti Mahal at Peshawar, which was owned by one Mr. Mukka Singh (who also arrived in India but was not heard there after). 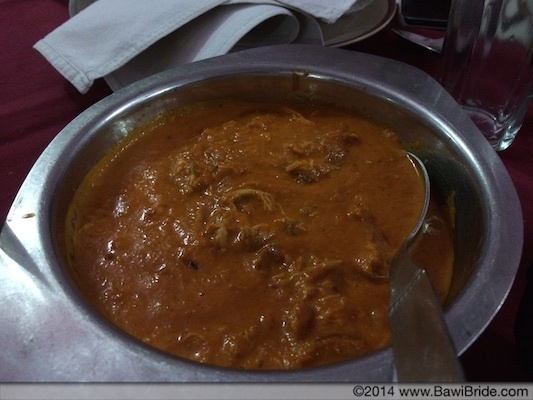 The Makhani Gravy was developed by a cook at the restaurant, Mr. Hansraj Kapotra and not Mr. Gujral (as is widely claimed). Moti Mahal was the most famous restaurant in Delhi for a very long time and a number of heads of state including our then prime minister Mr. Nehru have dined there. Thanks Nitin for the detailed history – wasn’t aware of the story behind it. As with most dishes, the founder of the restaurant often claims the name while the chef behind it goes unnoticed but glad to know about Mr. Kapotra’s genius!